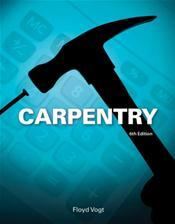 Refine the skills needed to become an accomplished professional carpenter with the in-depth coverage and practical applications found in Carpentry, 6E. This popular bestseller by well-known expert Floyd Vogt presents the intricate system of contemporary light frame building construction using step-by-step procedures. CARPENTRY, 6E follows the logical path of a residential project, using thorough explanations and easy-to-follow diagrams to explore building plans, sitework and layout, footings and foundations, framing, interior and exterior surfaces, cabinetry, and more. This edition blends traditional construction techniques with today's latest practices, including contemporary safety tools, alternative construction, such as concrete forms, and "green" building techniques. This edition also introduces more commercial drawings and construction. Photo-realistic drawings showcase concepts and procedures with detailed, easy to understand information. The new online CourseMate provides interactive learning tools to further ensure carpentry success.